In my work supporting PBL implementation in schools and districts, I sometimes run into teachers and administrators who have been turned off to PBL. Their message is generally something to the effect of, “Yes, we tried PBL, but it didn’t work for us.” When I ask about what soured their experience, the answer is usually related to one of several pitfalls of poor PBL implementation. Here are five common pitfalls and ideas on how to turn them into opportunities to strengthen PBL in classrooms. Powerful PBL connects students with real-world learning around challenging questions. 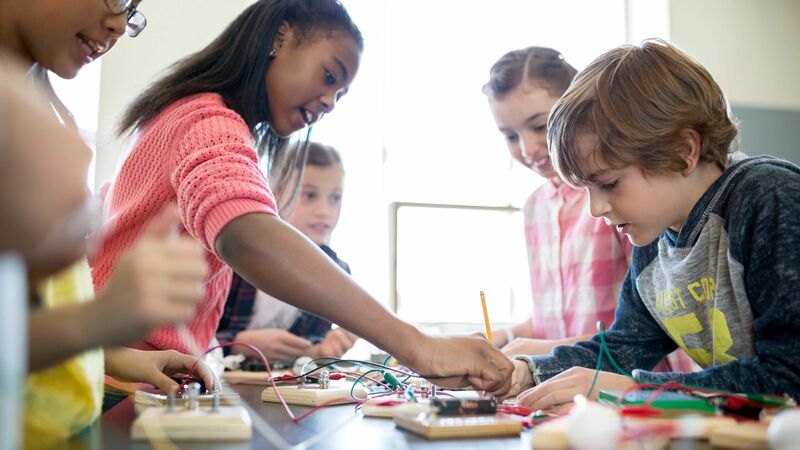 When PBL lacks the real-world connection, it can feel contrived and can lose the power to motivate students to engage in deeper learning. Teachers can make real-world connections by investigating a local or global issue, connecting to students’ personal interests and concerns, simulating a professional product, or simulating a professional process to solve a real-world problem. In working with teachers to design PBL, I often ask, “What do you want students to remember from this experience in 10 years?” This question helps us get to core ideas and powerful real-world connections. PBL is about projects, right? Not exactly. While there is real value in students learning how to create and refine publicly presented learning products, at its core PBL is powerful because it’s an inquiry-driven learning process. If we think of the product as the destination, inquiry is the engine that powers the bus to get us there. Engaging students in the process of inquiry involves guiding them to ask meaningful questions to investigate compelling real-world problems. Through this process, students build crucial problem-solving skills and learn how to generate creative solutions to complex problems. PBL is powerful because it teaches students not just content and product development but how to learn through inquiry. When I hear that a school is not getting strong student outcomes through PBL, I sometimes find there hasn’t been a process to design PBL around targeted standards and skills. This is not to say there isn’t value in open-ended approaches to PBL like Genius Hour. Allowing students to identify their own problem to tackle and to design their investigation can be extremely powerful. But for most classroom teachers, the reality is that PBL must address the stipulated content standards. A simple solution can be to start with the end in mind during the planning process. Whether a teacher is tackling a single content area or designing an interdisciplinary unit, a discussion of standards and how they can be connected to real-world learning opportunities is a powerful place to begin PBL planning. This should be followed by identifying how students will demonstrate mastery of targeted knowledge and skills at specified points during the learning process, product development, and culminating project presentations. In my early years of implementing PBL in the classroom, I often fell into the trap of trying to assess individual learning through group products, a virtually impossible task. While assessment of final products is important, it’s critical to plan both formative and summative assessment of individual learning throughout the course of a PBL unit. Formative assessment is especially important so that you can help students identify and address gaps in learning throughout the unit. I’m a big fan of self- and peer-assessment strategies since they build learner agency. Andrew Miller has assembled a helpful guide to resources and ideas for assessing PBL. Culture in a PBL classroom looks, feels, and sounds different from that in most traditional classrooms. In a PBL classroom, students are taking ownership of their learning. They are collaborating with peers and adults on meaningful work, often as part of a team. This idea of belonging is powerful, and research shows it can increase engagement and close achievement gaps. If students haven’t been involved in this type of team-focused environment in the past, however, it can create real challenges for them and for overall classroom management. An intentional approach to building a collaborative classroom can be critical to successful implementation of PBL. Strategies include having students do mini-challenges (like the marshmallow challenge) to reflect on how successful teams work, and giving students a voice in creating classroom norms. Erin Starkey offers additional strategies about building a collaborative classroom culture. One of the most rewarding aspects of well-implemented PBL is seeing students thrive as independent and engaged learners. By proactively addressing PBL pitfalls before they arise, teachers and administrators can launch powerful experiences that lead to strong student outcomes and that grow students as lifelong learners.